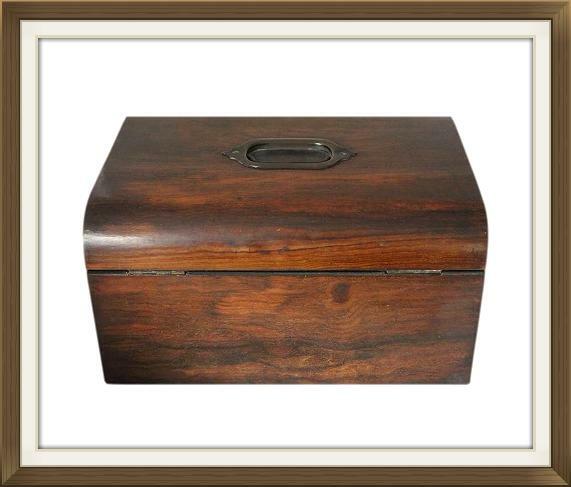 This is a beautiful large mid Victorian box, dating to 1850/60. 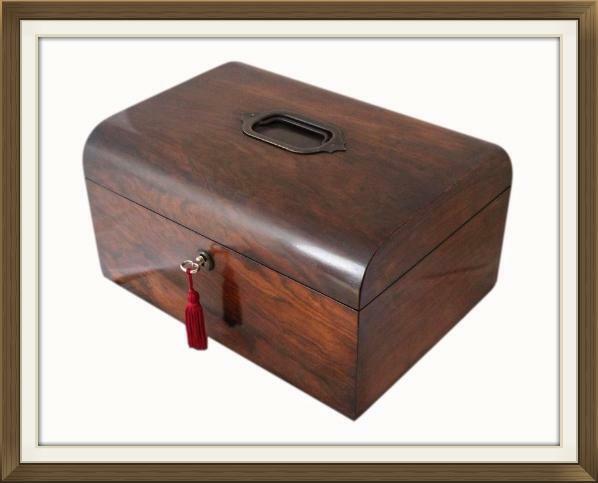 It has a wonderful Walnut veneer and is in complete original condition, with the exception of a replacement lock and key. 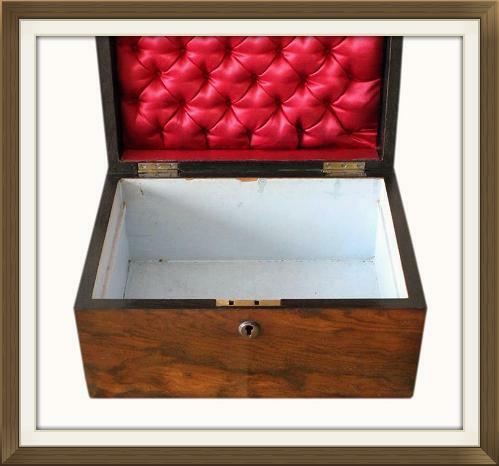 The box is multi functional and is for jewellery and/or sewing items. The large deep compartment in the base, can also be used for storing photos and letters etc, if desired. 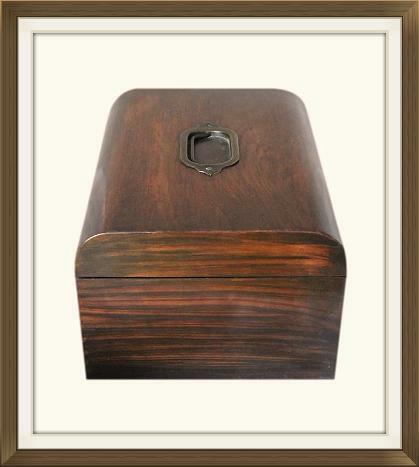 This box has a beautiful Walnut veneer which has lovely figuration and a deep rich colour. It has an unpolished inset metal handle on the lid, and a matching raised escutcheon to the keyhole. The bottom of the box has a hessian covering. 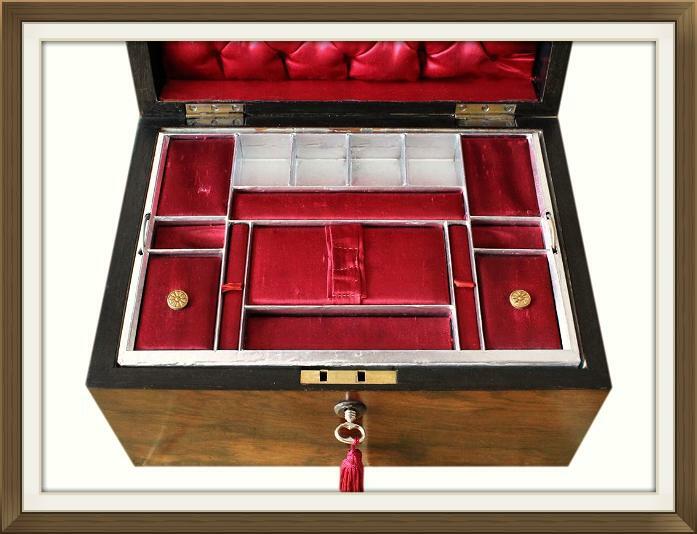 The box has its original quality brass 'stop' hinges. These prevent the lid from falling back. The lock and key are replacements. The interior has its original removable storage tray, and there is a very large, very deep, single storage compartment beneath it. 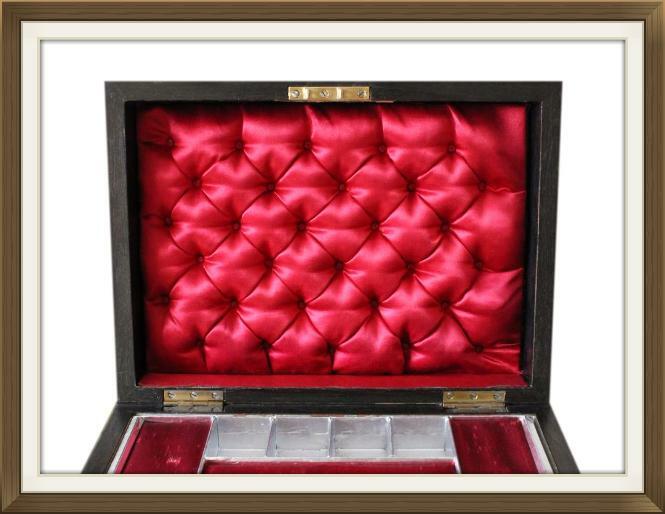 The tray has its original silver foil covering and metal handles on each side. It has a combination of shallow storage compartments (some of which have lids), and raised surfaces. The compartments can be used for storing small pieces of jewellery, or sewing items such as threads, pins, needles, and so on. There are two narrow sections to the front centre of the tray which lift out. These are for storing needles. 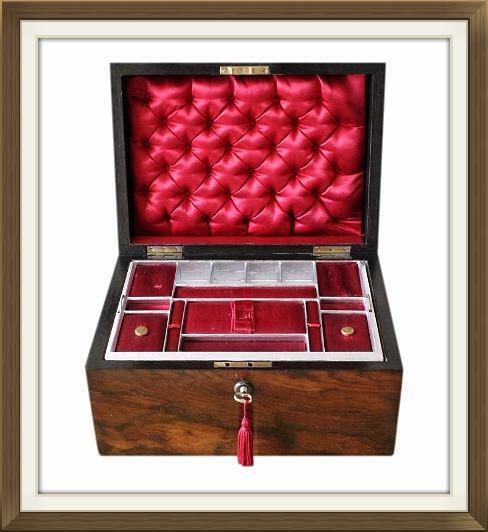 The compartments (except for the rear centre four), and the raised surfaces, have their original burgundy satin coverings. The inside of the lid has a superb thick padded silk panel. Again this is original. It is beautifully quilted and has deep satin buttoning. The large compartment beneath the tray is deep and extremely roomy. It has its original pale blue paper lining. 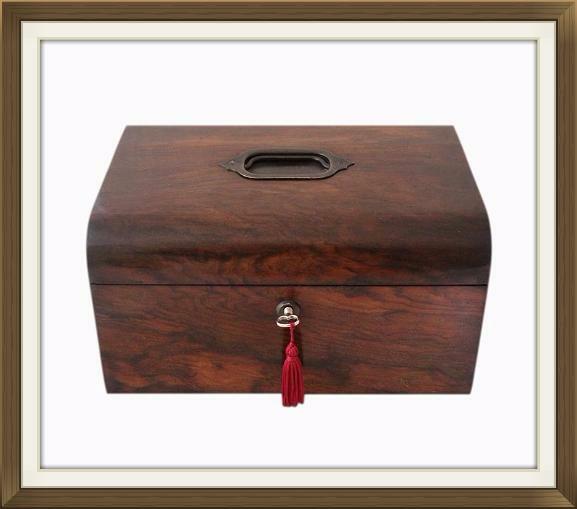 This compartment is roomy enough for letters/documents, photos, sewing and crossstitch patterns etc, and large pieces of jewellery such as bangles and watches. It will also hold a vast amount of sewing items and implements such as cotton reels and crochet hooks. 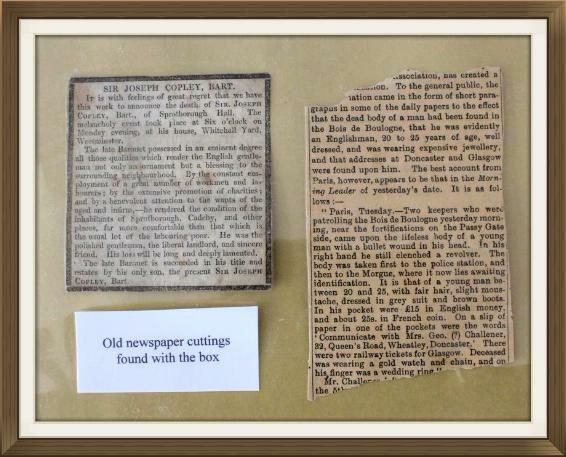 Included with this box are two old newspaper cuttings that were found inside it. One relates to a Sir Joseph Copley, Baronet, of Sprotborough Hall. This was a large home built for the Copley family in 1670. It is possible that this box was owned by a member of the family. 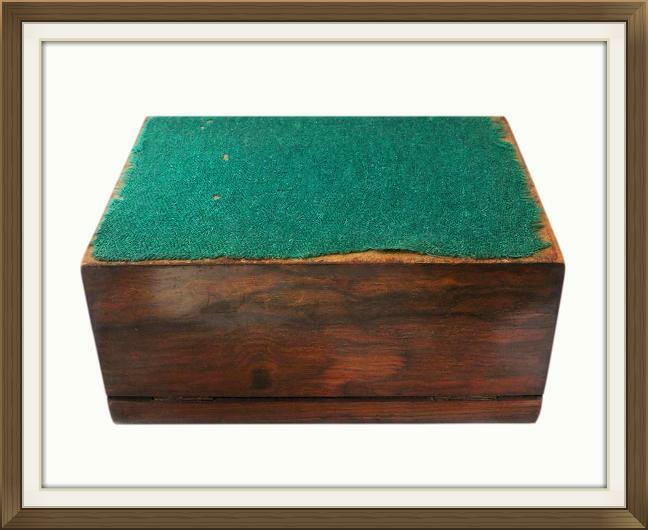 This wonderful box is in very good condition for its 150 plus years of age. It is in original untouched condition, apart from the lock, and as such it has some wear from age and use. The wear is light and minor overall. Wear around the edges of the hessian covering to the bottom. A fine superficial hairline crack on the right side of the box, on the lid. This is not very noticeable. Wear/marks to the blue paper lining in the large compartment. All of the above are as we'd expect on an original untouched antique box of this age which has been loved and used for its purpose. Each 4.2 by 3.2cm with a 2.3cm depth. 10.6 by 5.7cm with a 1.6cm depth. Each 6.0 by 4.3cm with a 1.6cm depth. 25.0 by 18.3cm with a 7.5cm depth.